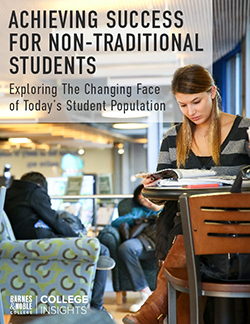 Across its network of 770 stores, Barnes & Noble College has been able to build a national insight community of 6.5 million students, faculty, alumni and staff. “We now have the capability, and a better understanding of the implications of that capability, that research can drive our business,” says Marie Policastro, Director of Partnership Marketing for Barnes & Noble College, “and we’re finding out, specifically and actionably from those customers, where we could go as a company and what we should be doing next,” she says. How that’s achieved has less to do with the classic backroom research tradition and everything to do with the privileged access the company enjoys with its insight communities. “It’s not just about running numbers,” Policastro stresses. “Our research is about the work our Field teams and booksellers put into the customer relationship. Every interaction, any time they get feedback, that’s research ─ it’s about listening, learning and acting,” she says. Across its network of 770 stores, Barnes & Noble College has been able to build a national insight community of 6.5 million students, faculty, alumni and staff. Questions, comments or ideas from customers, booksellers and Barnes & Noble College staff are attributed value and used to guide home office policy and direction. In this way, every product or service initiative — and every marketing message the company releases — is in some way sanctioned by its intended audience. How unique is that approach? Policastro provides some context. “The nature of our business is in being service oriented — and in being particularly customer centric,” she says. “And our students clearly understand that they can absolutely use their influence to deliver experiences that are unique to them. As a company, Barnes & Noble College has appreciated the diversity of its customer base — parents, campus administration, faculty, alumni, and even the students themselves — developing the kind of listening versatility and agility that allows individualized responses. “We have the opportunity to capture a transaction and make the experience 100 percent satisfactory,” Policastro says, citing the company’s Price Match program as an example where a service opportunity was created from giving the customers what they were asking for. Unlike companies that guard their proprietary studies, the research Barnes & Noble College gathers from its insight communities is widely shared within the industry. 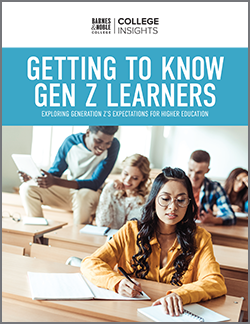 Examples are its large-scale research into the preferences of Millennials, Generation Z and Non-Traditional Students, which offer enhanced campus experiences for partner brands. Having the kind of research platform that Barnes & Noble College has built isn’t a luxury, Malat believes. “If you’re going to just compete on price, or if you’re going to look at yourself as a retail transaction, you’re going to lose — especially with this generation,” she says. “We’re a strategic partner to the universities we serve, helping them realize their goal of increased student retention, graduation rates and overall student satisfaction. We do that by listening,” she adds, citing the value that Barnes & Noble College can bring with products and service expectations, which are more aligned with students’ values and that can deliver a relevant message at the right time.